– At your two month checkup you weighed 11 lbs. 6 oz. which puts you in the 53rd percentile. For your height you measured in at 23 inches even, putting you in the 43rd percentile. The doc. was impressed that you nearly doubled your birth weights in two months. -You think getting your diaper changed is the most hilarious thing ever. Every time we change your diaper you have the biggest smile on your face while we do it. You're just so happy when getting your diaper changed, it's adorable. I usually take this time to laugh with you, and talk with you, and smile with you. – You're so easy to make smile. You're such a happy little boy! – You love mirrors and looking at yourself in them. We have mirror time everyday where we look at ourselves and all of our facial features: our cheeks, nose, lips, eyes. You love looking at yourself and mommy in the mirror. - You've discovered your tongue and you tend to stick it out a lot while getting your diaper changed. I think you do it when you're concentrating on something. - You've also stated putting your hands in your mouth. You used to do this exclusively as a sign of hunger, but now you just enjoy sucking on your fingers. – You're sleeping for 5 1/2 hour stretches on most nights, from about 10:30 or 11:30 to 4 or 5 in the morning. 5 1/2 hours stretches are good, but mommy looks forward to longer stretches. – For your first feeding in the wee early morning, mommy takes you into the guest bedroom/nursery and nurses you lying down. Mommy enjoys this time because it's always so sweet to nurse you, but mostly because she can doze off again for a little bit. – Nursing while lying down is our new favorite position. We do it in the early mornings and we do for the last feeding of the night before we go to bed. At the nighttime feedings we listen to lullabies as you drift off to sleep. It's a very sweet and relaxing time for both of us. – You're still sleeping in mommy and daddy's bedroom. Mommy's not sure when she wants to make the transition to the nursery. That thought makes mommy a little sad. She loves having you by her side of the bed at night nice and close to her. Mommy knows she'll have to do it eventually, but for now you're going to stay nice and safe next to mommy. – You love to push up on your legs and stand up. You look very proud of yourself and how strong you are. Such a cute face. – You've become more independent lately. You can sit in your bouncy chair or rocker and amuse yourself these days. We used to have to entertain you all the time, but now you are able to do it yourself for a little while. Yay Hudson! – We think you're eyes are going to stay blue. Your eyes are identical to daddy's, so they have stay blue. It wouldn't make sense if they turn brown. - You had your two-month shots this week and you were a total trooper. You cried when the shots went in and only for a moment afterwords. I nursed your immediately after which I thing helped to calm you. You didn't get a fever and you didn't complain about being sore. Nicely done! – Daddy changes your diaper all the time and is very helpful with that. He usually will change it in the morning after I finish feeding you, so I get to keep relaxing and resting while he does. -You and daddy will chill on the couch and watch TV together. So cute. – You're super talkative these days making all sorts of noises while talking to yourself and talking to us. Love it! Isn't it amazing how much babies change in just a short amount of time?! 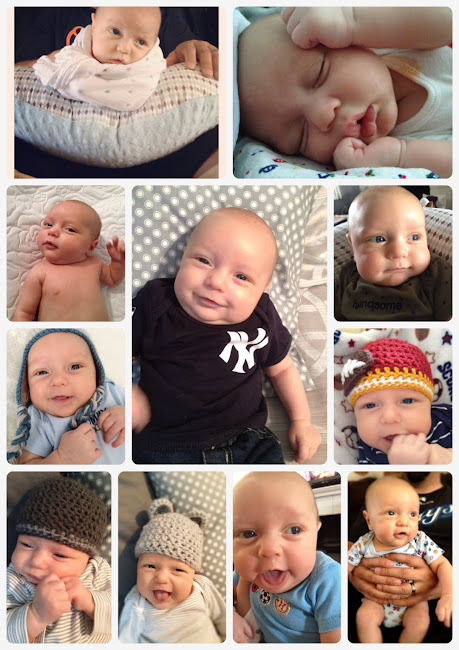 I love this update and reading about all of the new things in Hudson's little life! I think that's so cute that he laughs when you change his diaper. I hope I get a baby that does that! Im glad the shots went well!!!! He's so sweet! Love his smile!